Public termae of Segobriga, at Saelices, Cuenca. Plan for the public termae of Segobriga. Works begun at the end of 1st. century were made by an Imperial order. 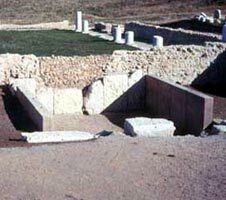 They were placed at the westen side of the comitium, behind the temple for Imperial worship, at the higher part of the city in order to enjoy sunlight hours. Access was made through a door at a side of the façade, after transversal access stairs placed between the Temple and the termal building. With a rectangular plan -88 m. x 40 m.-, disposition was very single for this construction, since there was just one-direction way through the same rooms. At the entry there was a big patio peristyle with columns, and a base supporting a statue presiding thes area were meetings and social gatherings were celebrated. 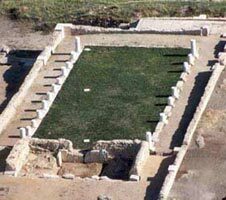 Then, two lateral corridors served as dressing-rooms -apodyterium- and gave access to a frigidarium, pavimented with chessboard red and white mosaic and a cool water central swimming-pool. Another frigidarium, with an apsal shape -lately used as a hermitage-, with a little bath, gave pass to the tepidarium. Behind it, there was a caldarium. These two rooms had a ground made of bricks that transfered warmth created by two furnaces. Today this caldarium is under the hermitage major nave, that, probably used basements of the termal lacunicum in order to elevate its apse. This building was endowed with several drainages, not only for water used at termae, but also for water employed for cleaning different rooms.